With technology advancement, information is within easy reach. The world wide web is rich of content, easy to find through different search engines. Copy/Paste is a great combination don't you think? Ctrl+C and Ctrl+V are my friends when I'm researching, making notes or writing technical paper. Very helpful, very efficient. But on the blockchain, when irresponsibly done, is detrimental. For my second anti-abuse contribution, I'm tackling one of the laziest type of abuse - Copy/Paste. Copy/Paste is one step closer to plagiarism. It is copied content with attribution to the source. And when you read the post, it has zero to very little original content. I said lazy work. Copy someone's blog, paste it on an editor, type in the source and post. Now it's on the blockchain adding zero value. It adds to the junk already there. Let's see how else copy/paste is defined. I'm not that far off on my definition. That's good, that means we're on the same page. If you define it otherwise, what would you call it? This is a simple example of how I find this type of abuse. When you keep sniffing the blockchain, you'll get a good feel of where to start looking. Scroll through the new post submissions. We're looking for some generic information one can easily grab from the web. Remember, it's lazy work. Think about what a lazy person would do for easy rewards. What tags or niche are the most popular? I have a gut feeling about the first and last post. After fighting abuse, you might get gut feelings too. The Korean review I'll skip for obvious reasons. I'll also skip the "Sunny day" post since I'm not looking for image plagiarism. Note what tags were used on the first and last posts? Yes, "crypto" and "cryptocurrency". Let's check these posts one at a time, starting with the Daily market report. Uh oh, I think I've seen this chart before. It looks familiar. Bingo! Go to CoinMarketCap.com and check this data. The post is now 32 minutes old with no rewards. Sure enough, the post is matching the format of CoinMarketCap's homepage, only showing the first four columns. This is a classic example of copy/paste. No original content written by the account. One can go to the Coinmarketcap website directly for this information. Looking deeper into the previous posts of this account, we can see multiple instances of copy/paste posts. An hour passed, the post we're investigating is now at $2.58. Let's report this to Steem Cleaners. Let's do the same thing for that first post I was eyeing. Let's open that link and see the post. Oh boy, only a screen shot from somewhere. There are only 3 sentences. Notice the number of upvotes. I'll check that later. This smells like vote farming. Looking at all the posts, it's another oh boy. This is flag-able and reportable. This is not copy/paste. More like spam and vote farming. Tagging @pjau, @patrice, @guiltyparties. I found another vote farm. Scouting for abuse on the New page gave us 2 easy leads. Do they add any value to you? Thanks for abuse hunting with me. I hope you try this simple technique of finding abuse. The blockchain is full of them and you'll never run out of things to report to Steem Cleaners. Copy/paste is a good tool in general. But in the wrong hands, it is a nuisance to those who create original content. -- This is a good read on why plagiarism and copy/paste types of abuse are bad for the platform. -- This is a 2-yr old post. 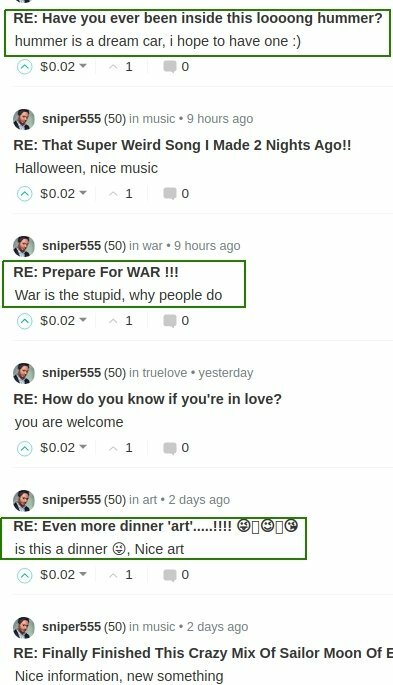 It's the account's first post and has a negative concept of Steemit due to abuse. Thank you for your contribution to the antiabuse initiative. Copy/Paste is one of the most important abuse categories as here everyone can learn that it is about originality and not giving a source. That there are different kinds of Copy/Paste is well shown by you. I liked that you took two examples pointing out the definitions of Copy/Paste. A good example could also be the standard Copy/Paste post with written text and a source like this one but yours are fine as well. When explaining how to submit the report to steemcleaners you say to either insert your account name or leave it blanc. This was like this on the old website, currently you should 'steemcleaners' if you want to report anonymously. Thanks Naturicia! It's fixed now. I imagined it was going to be difficult to find an example while I was writing the post. Those 2 caught my eye and they were both good find. It is sad that it's that easy to find abuse when you look. I'm sure you share the same sentiment. For the next post about plagiarism you can go and look into the steemcleaners reports (as I did here). You didn't find it then but can be a good additional example if you didn't find what you exactly want. That's right. But sadly, I think we are too late finding these 2 accounts. They have been doing this for a long time. Which will encourage the new Steemians who saw this that this type of content is ok -- when in reality, is NOT. Wow!! Could you kindly discuss on image plagiarism. Thank you for the blog post. I will be working on plagiarism next. Definitely a tough topic since the image plagiarism is getting more difficult to prove and track. No, don't use mobile hahaha. I got some eyes on it. I'll drop it at SC. See if I can find a way to extract voters quickly. @sniper555, your comment seems a little spammy. This type of comment attracts downvotes from anti-abuse Steemians. I would advise that you read the post and comment thoughtfully. If English is not your first language, you can still comment on your native language and we'll just translate it. I boxed the good comments you made recently. These were thoughtful comments to the posts. Keep it up. The thank you was appropriate too. The rest are generic and can be flagged if you're not careful. You upvoted this post 7% and you upvoted your comment 100%. I can still look at this as self-vote violation because the 7% is actually a zero value vote. It takes away from the rewards. We also call it sniping. You might be wasting that $0.02 upvote. If it doesn't meet the dust payout threshold you won't see that reward on 7th day. haha, this was a surprisingly fun read. Felt like I went on an adventure with you [ I can see it now: Bug Hunt, an all new original series coming soon to HBO ]. Thank you for cleaning up the chain. Obviously no issue with copy & pasting, but just burn your rewards. Don't accept them. If you're just gonna use Steem as a semi-archive tool [ even though there are better methods for that ], then at least don't take from the rewards pool.